Rosary beads are a symbol of the divinity and association of Jesus Christ with Christianity. 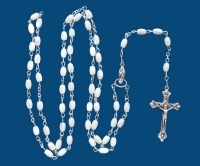 People interested in having the best and fine quality rosary beads need to know where to get rosary beads. And the simple answer to this question is visiting the website “HolyLand-Gifts.com” and finding a wide and exhaustive variety of rosary beads made of pearl and olive wood. We leave no stone unturned to make our customers happy and satisfied with a fine collection of exquisite and unique rosary beads designed and crafted by Bethlehem Christian artists who give birth to fine quality religious items. When you hold a very beautiful mother of pearl rosary or olivewood rosary in your hands and use it for prayer and meditation, you form an inseparable connection between you and the almighty as the rosary beads condense your faith and confidence in Christianity. So, what are you waiting for? Extend you hand and place an online order to have a special gift for your religious uplifting.